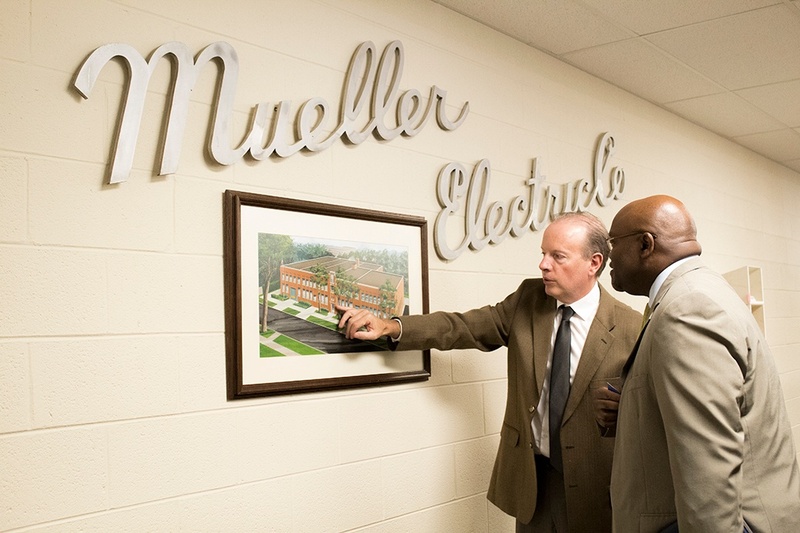 This year marks Akron-based Mueller Electric Company's 110th Anniversary and the firm is celebrating its long history in Northeast Ohio along with its impact on innovation and industry around the world. Acknowledging the importance of the company, the City of Akron's Mayor Daniel Horrigan today issued a proclamation permanently designating July 20th, 2018 as "Mueller Electric Company Day." The official proclamation was presented by Akron’s Deputy Mayor of Economic Development Sam DeShazior at Mueller Electric’s headquarters before an audience of Mueller Electric employees, some of whom have been with the company for over 20 years. “We congratulate Mueller Electric on 110 years of innovation and service here in Northeast Ohio. It's companies like Mueller who have adjusted to the changes in technology and innovation that continue to be the industry leaders and are the backbone of our local Akron economy,“ DeShazior said. Since Mueller was established in 1908, the company has transformed from being the inventor of the electrical test clip to one of the world’s leading suppliers of alligator (crocodile) clips, custom assemblies including grounding assemblies and sensing leads, as well as other electrical components. Mueller Electric is responsible for inventing some of the most well-known metal clips on the market today, including the battery charging clips found on jumper cables for cars as well as the famous alligator clip. The former Mueller factory in downtown Cleveland was built in 1922 and is now on the National Register for Historic Places. It is currently undergoing a historic renovation to be converted into residential lofts. It was here that Mueller's assembly department employed 48 women who put together as many as 85,000 clips per day. During World War II, all 41 million clips produced by Mueller Electric were needed by the armed forces for every branch of the military. Every battleship also had a large stock of Mueller clips for quick electrical repairs. These devices weren’t just for electrical purposes, either. In the US Navy, every single life jacket (over 1.2 million of them) was equipped with a flashlight held high on the shoulder by a Mueller clip to alert rescuers. Over the years, the company gained worldwide recognition for its high quality electrical products in industries that included transportation, oil and gas, aviation, automobile, military and construction and expanded its inventory from just clips to include a wide range of products designed to help power the world. In 2011 the company was acquired by Desco Corp. and now resides in a facility in nearby Akron, Ohio. Mueller continues to be a force of innovation while keeping up with trends and emerging technologies. New products and distributors are constantly added. In 2017 alone, Mueller added 257 new products and expanded into automated painting, utilities, medical and the "call before you dig" underground sensing markets. Mueller employs a strong team at its Akron facility to quickly and efficiently produce custom cable assemblies for its clients across many industries including several of the largest automobile companies in the world. The beginning of 2018 also saw new partnerships for Mueller -- including those located in Europe -- which is driving its robust market expansion in the United Kingdom. In 2018 Mueller expects to enjoy booming growth as a result of the many new products developed and partnerships nurtured.